Flexzilla SwivelGrip Garden Hose 5/8 inch x 50 ft.
SwivelGrip Connections. Extreme all-weather flexibility. Lightweight and easy to handle. Won't kink under pressure. Lays flat - no memory. Durable and abrasion-resistant outer cover. With its uniquely coiled design that actually puts itself away, Springhose 3/8-inch by 50 feet offers a flexible and ultra lightweight watering solution with convenience in mind. SpringHose is drinking water safe and is equipped with anti-corrosive max-flow fittings. When you have completed your watering chores, SpringHose retracts to its original compact form and stores easily. A watering system ideal for all of your patio, deck and greenhouse watering chores with convenience in mind. Advantage 50 ft. Expanding Garden Hose with Nozzle The Advantage 50' Expanding Garden Hose with Nozzle is a high performance dual chamber garden hose that automatically expands up to 3X its length while giving you a powerful high-flow water spray. Simply watch our hose expand and contract as your water is turned on and off. Our strong and ultra lightweight garden hose will not twist, tangle or kink and the accordion design allows for ease of use and compact storage. No more struggling with heavy traditional style garden hoses. 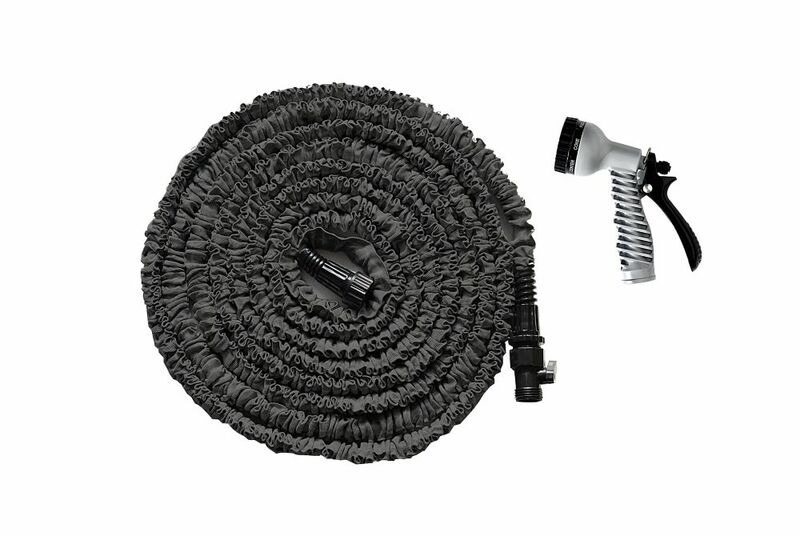 The Advantage Expanding Garden Hose simplifies your work around the house and yard and is perfect for all your outdoor watering applications !!! Advantage 50 ft. Expanding Garden Hose with Nozzle is rated 3.5 out of 5 by 27. Rated 5 out of 5 by 4Water from Ingenious product! I bought this product for a specific application and it met the need perfectly. Rated 1 out of 5 by Unhappy from Lousy Product I bought two of the same product. Both broke after a few months. Very poor product. Rated 5 out of 5 by Connie from Great hose for your garage I use it for washing my car, light and easy to store, I bought another one for my parents. Rated 1 out of 5 by fortdomi from Very bad experience The garden hose leaked after 2 months at which time I did not have my proof of purchase anymore. I showed up at the Home Depot and I was told that they did not sell this type. As a result, I had to throw it.